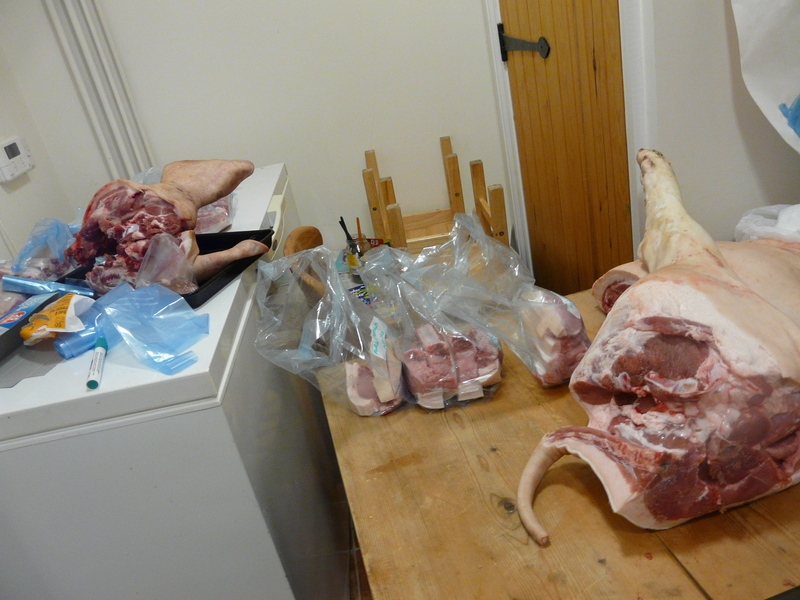 Our boy pig had started looking at his sisters in a rather unwholesome fashion, so he went to ‘market‘ last week. We were hopeful he’d kill at at least 65kg, so were delighted he made it to a healthy 72kg. In fact he only just fitted into the boot of the car! 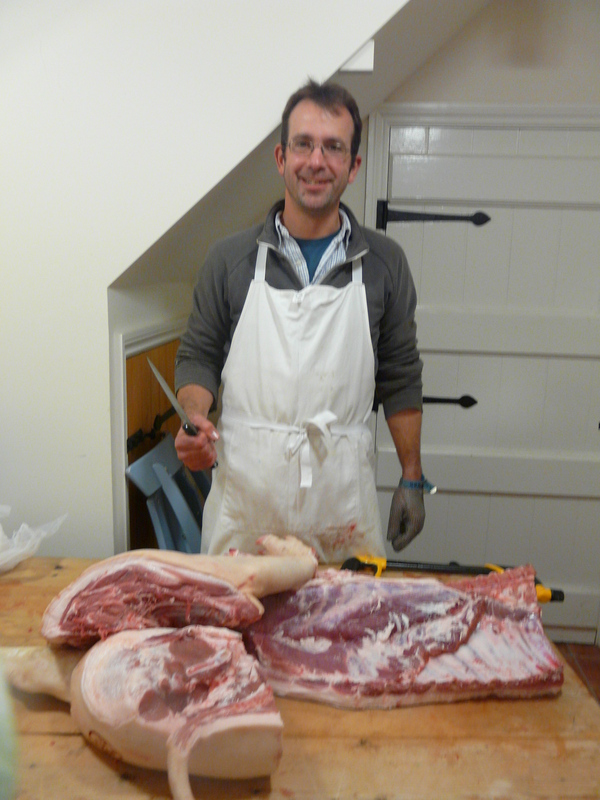 This was our first time butchering a pig carcass without the expert guidance of Craig, on a very busy weekend, and without any suitable equipment. Luckily a kind local farmer produced a chain mail glove just in time, and we found a helpful youtube video to remind us where to start. 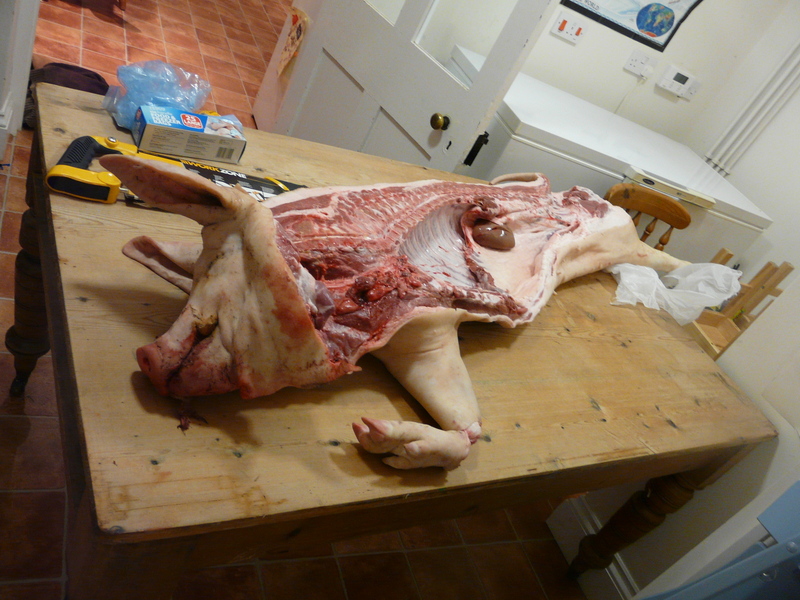 First chop the pig into primal cuts – loin, belly, shoulder and leg. Breaking it down into chops and steaks. Any takers for a tail? 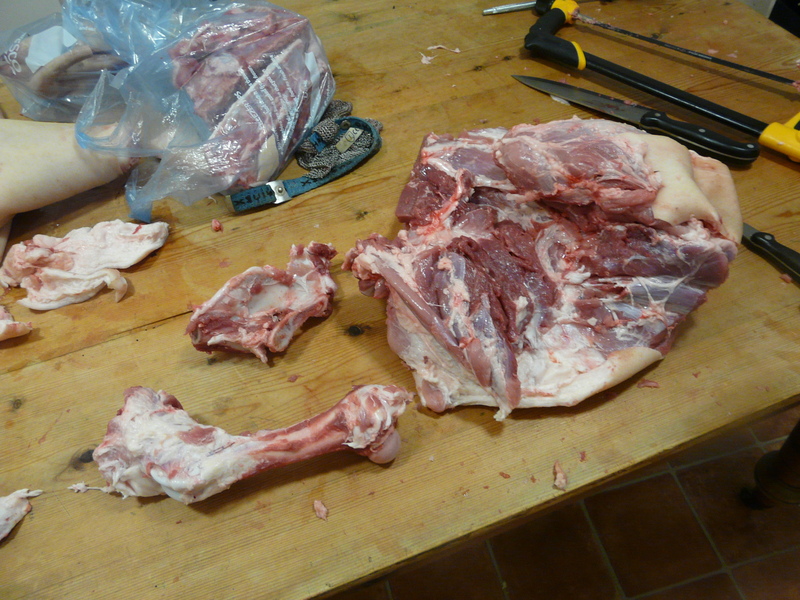 Boning out the leg was a tricky manoevre. 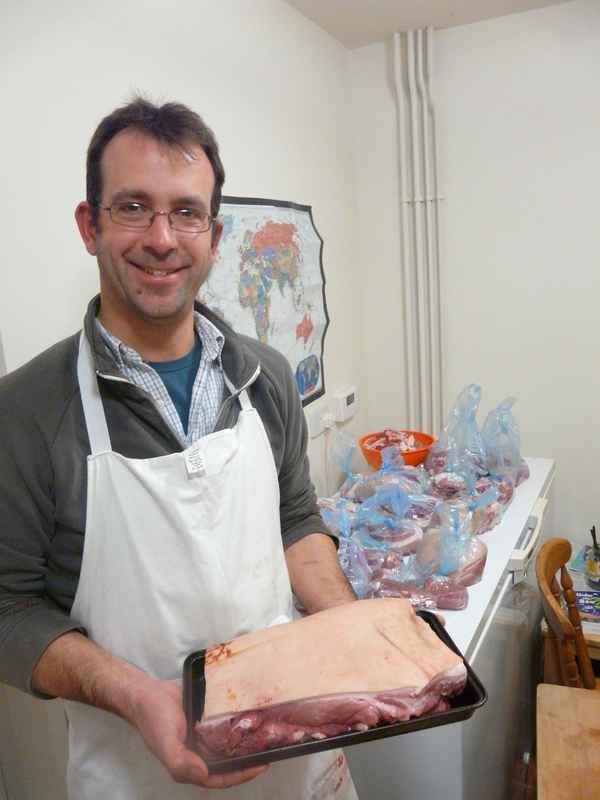 Simon wielding the spare rib roast – a section of the shoulder – ready to go into the oven. We finished half the pig in four hours, at 1am. Joint for lunch went into the oven at 110 degrees ready for a very slow roast. It was delicious – we turned up the temperature at the end to get crispy crackling, while the meat was super-tender and moist underneath. The second half took one man just three hours, so either it gets easier every time, or I’m a massive hindrance. 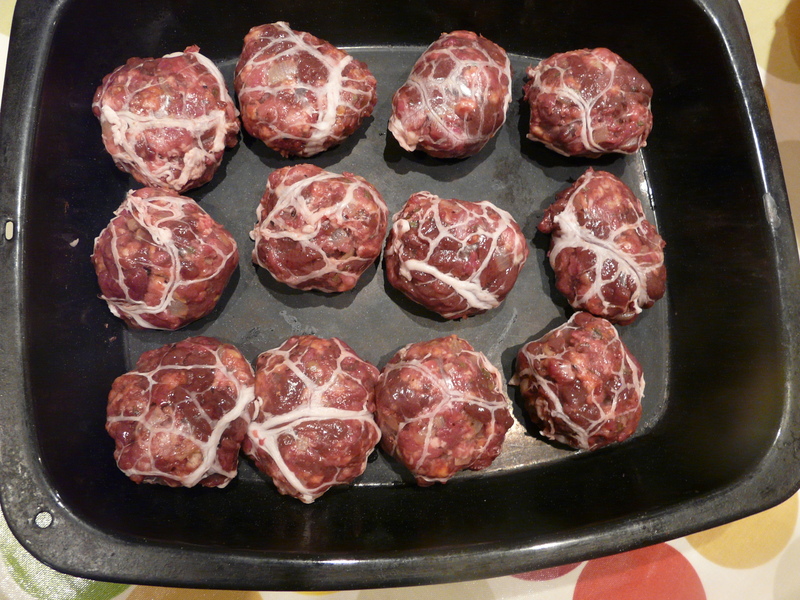 I spent about the same amount of time rustling up these faggots, just ready for a dousing in onion gravy and long slow roast. Yum. Who’s left on the farm?